Two moods settled over me today. I was in the mood for the smooth sauce of a poached egg yolk at the same time that I felt like making an asparagus risotto. Egg and asparagus: the last gasps of Easter. The runny egg yolk was easy. The more difficult task was intensifying the flavor of asparagus in the carnaroli rice enriched with chicken stock. It occurred to me that putting some of the asparagus in a blender had potential. In the following recipe, I use 1 cup of rice, which produced enough risotto for three meals. 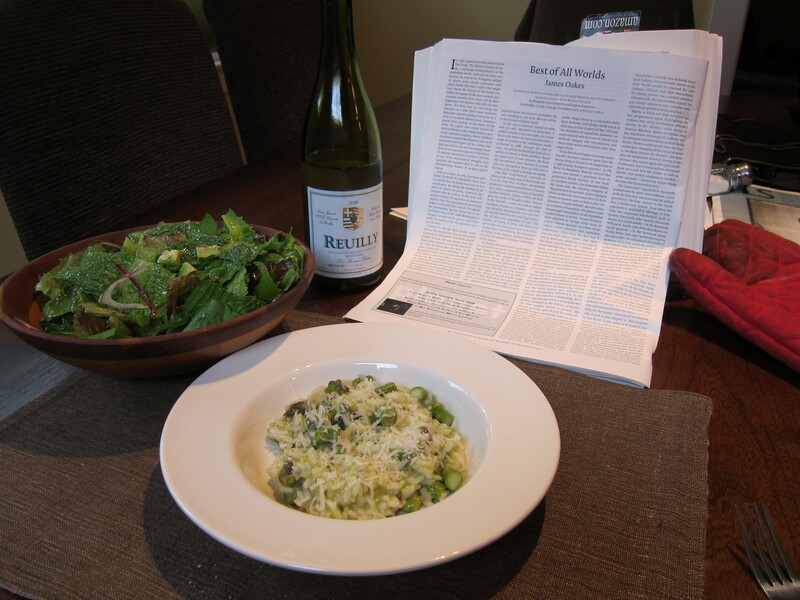 If you’re not used to making risotto, read through the instructions before starting. You’ll need a few pots and time to organize yourself. Bring a big pot of well-salted water to boil (lots of salt and lots of room in the water help the asparagus retain their bright color). While the water is coming to a boil, cut an inch off the thick ends of the asparagus spears. Either save them for making asparagus soup later or discard. Cut the spears in half. Slice the lower halves into chunks and set aside. You will eventually puree these. Then, slice at an angle the spear tips into slices. Set them to the side. These you will add to the rice shortly before the rice has completed cooking. When the big pot of water is boiling, drop the asparagus pieces you’ll puree into the water and blanch for 2-3 minutes. Scoop out with slotted spoon or wire-mesh spider into a strainer and run under cold water. Drop the remaining asparagus pieces (the sliced tips) into the water to blanch for 2-3 minutes. While they’re in the water, put the already-blanched asparagus pieces into a blender. Add a little water to moisten them. Puree and let them sit in the blender jar until you’re ready to add them to the risotto. Scoop the asparagus spears still in the water into a strainer and run them under cold water to stop them from cooking. Bring the chicken stock to barely a simmer in a saucepan on the stove. In a heavy-bottomed sauce pan, heat over a low-to-medium flame a tablespoon or so of olive oil. Sauté the chopped onion, shallot or green garlic until softened. Pour in the one cup of rice and stir to coat with the oil and sauteed onion. Stir to prevent the rice from sticking to the bottom. When the rice has turned translucent, add a ladle of chicken broth to the rice, stir, and adjust heat so that it barely simmers. For unsubstantiated and probably superstitious reasons, I don’t add salt (or wine) to a risotto until well after the rice has begun to soften. Meanwhile, keep stirring the rice to prevent it from sticking to the bottom as it absorbs the chicken broth. Think of each ladleful of broth as a layer of flavor. Don’t add another scoop of broth until the previous one has been almost completely absorbed. Stretch out the addition of broth so that the rice simmers slowly for 20 to 30 mins. The risotto should not bubble vigorously. Every once in a while, taste the rice to determine how soft it has become. Meanwhile, poach an egg. Bring a small saucepan of water deep enough to cover an egg to a boil. Add 1 teaspoon of white distilled vinegar. Reduce the flame so that the water softly boils. Crack an egg into a very small bowl, hold it to the lip of the saucepan and tip it into the water. Cook the egg for 2 1/2 to 3 minutes. Season the risotto if you find it needs salt. Scoop a third of the rice into a serving bowl. Remove the now poached egg from the water, let the water drain off it, and place on top of the risotto. Break apart to let the yolk run over the mound of rice. Serve yourself immediately. Save the other two-thirds of the risotto for experimenting with leftovers. Note to self for leftovers: instead of poaching an egg, separate a yolk from egg whites. As soon as risotto serving is hot and ready to be eaten, create a depression in the mound of rice and pour the raw egg yolk into it. Serve immediately. If I were serving this for two people, I’d beg my friend Spring to give up one of her duck eggs. That would be delicious. Pingback: Fast Flat Stomach Foods | Learn How to Get a Flat Stomach Fast!